Seniors find the Oliva Nova Golf Course in Valencia, Spain the ideal location for a round of golf and a fairly easy walk where they can use their pull carts instead of power carts. Under sunny skies, which is a common thing in Oliva Nova in Valencia, Spain, seniors walk to their next shot with their golf pull carts. Where their next shot lies is yet to be seen but they are walking down the middle of the fairway of the golf course, so their balls are not that far out of play. Seniors love to play golf here as the walk is not too strenuous and it is easy to use pull carts instead of power carts. Not only are they getting exercise playing at the Oliva Nova Golf Course, they are getting a great walk in at the same time. The fairways are wide open on a lot of the holes but water comes into play on a majority of them. The sand traps are fairly tricky to get out of and the greens can be challenging to read. 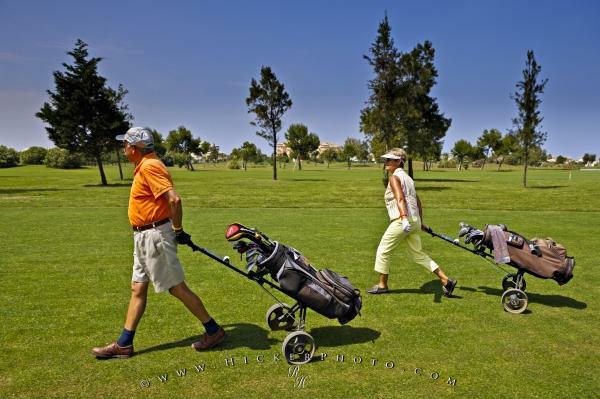 Photo of a couple of seniors with their golf pull carts on the fairway of the Oliva Nova Golf Course in Valencia, Spain. Pictures from photo gallery "Costa Blanca"
This picture is part of the photo album "Costa Blanca" - there are more beautiful images waiting for you. Riding around the Oliva Nova Golf Course on power carts or using pull carts is a personal choice. Whichever way you choose to get around will not make any difference to your score, it is all in the way you hit your golf ball.Couple walking with their golf carts at the Oliva Nova Golf Course, Club de Golf Oliva Nova, an 18 hole golf Course in the town of Oliva Nova, Costa Blanca, Valencia, Spain, Europe. Model Released. Here you can find some more great golf photos. I photographed this photo with the digital SLR camera model Canon EOS-1Ds Mark II, aperture of f/6.3, exposure time of 1/250 sec. on ISO 100, as always I used a original Canon Lens, the focus lenght for this picture was 24mm.